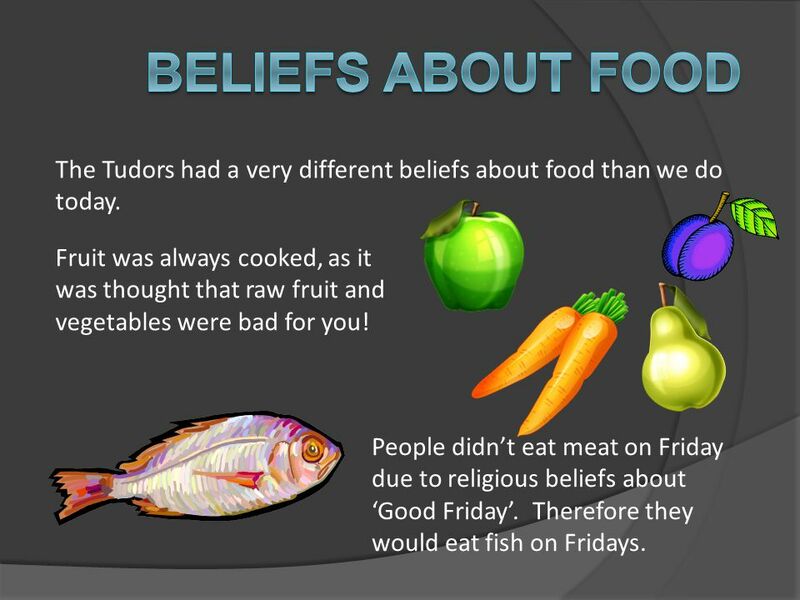 3 Beliefs about food The Tudors had a very different beliefs about food than we do today. Fruit was always cooked, as it was thought that raw fruit and vegetables were bad for you! People didn’t eat meat on Friday due to religious beliefs about ‘Good Friday’. Therefore they would eat fish on Fridays. 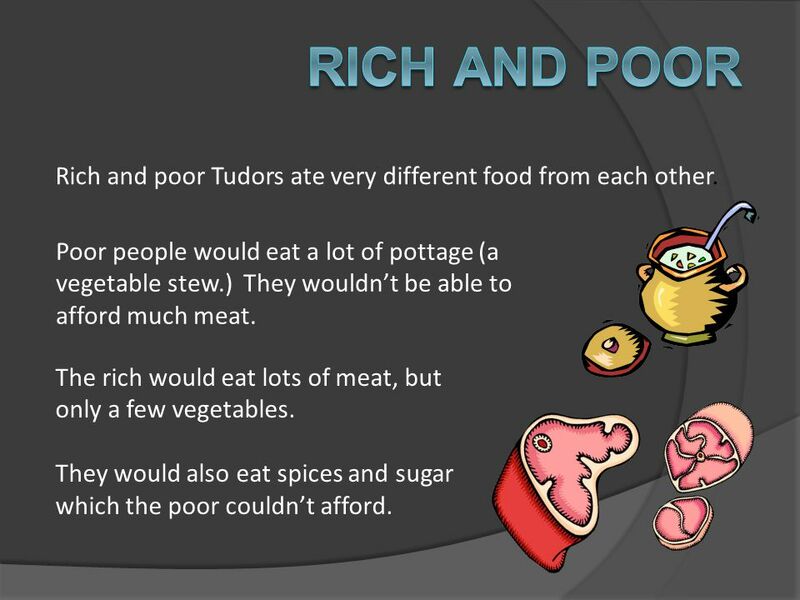 4 Rich and Poor Rich and poor Tudors ate very different food from each other. Poor people would eat a lot of pottage (a vegetable stew.) They wouldn’t be able to afford much meat. The rich would eat lots of meat, but only a few vegetables. They would also eat spices and sugar which the poor couldn’t afford. 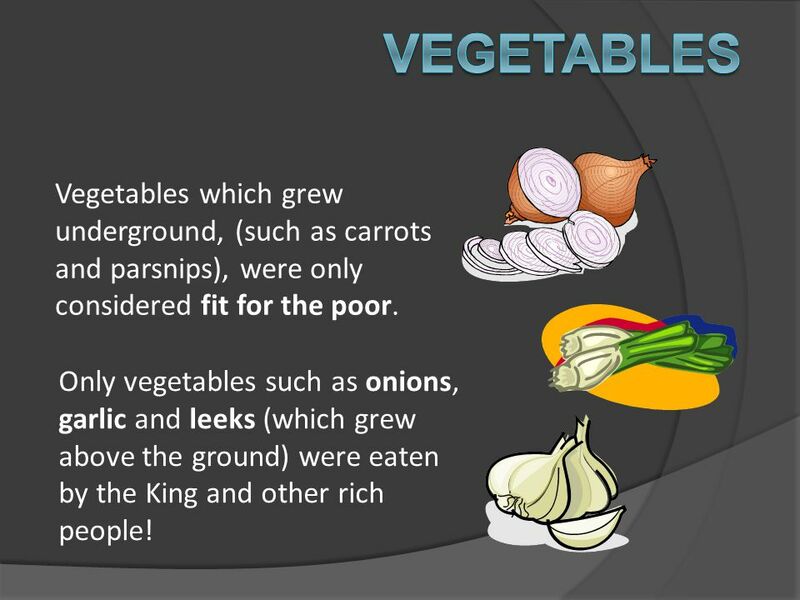 5 Vegetables Vegetables which grew underground, (such as carrots and parsnips), were only considered fit for the poor. Only vegetables such as onions, garlic and leeks (which grew above the ground) were eaten by the King and other rich people! 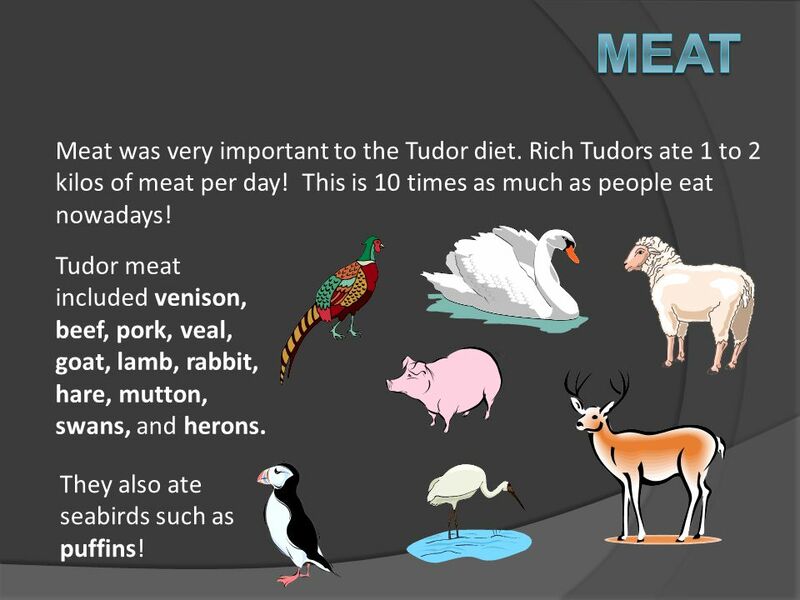 6 Meat Meat was very important to the Tudor diet. Rich Tudors ate 1 to 2 kilos of meat per day! This is 10 times as much as people eat nowadays! 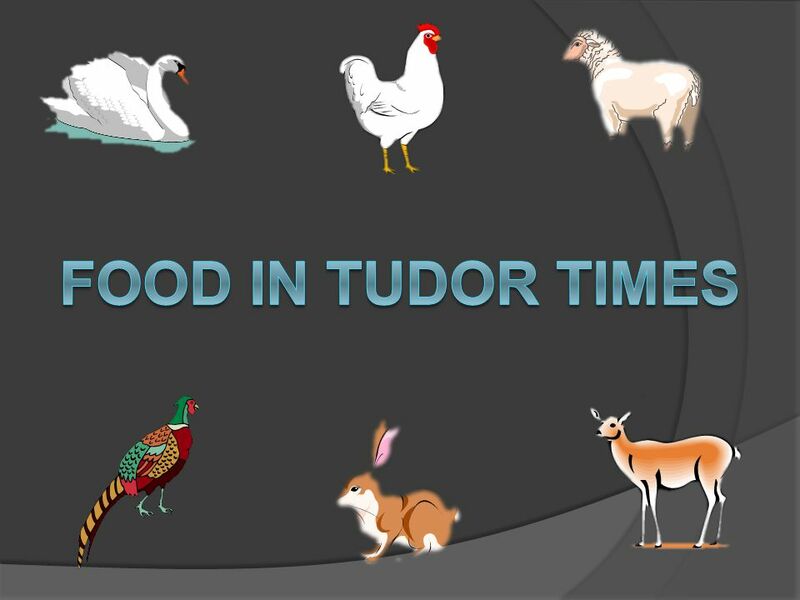 Tudor meat included venison, beef, pork, veal, goat, lamb, rabbit, hare, mutton, swans, and herons. They also ate seabirds such as puffins! 7 Poaching Only lords and nobles of Tudor England were allowed to hunt deer, boar, hares and rabbits! 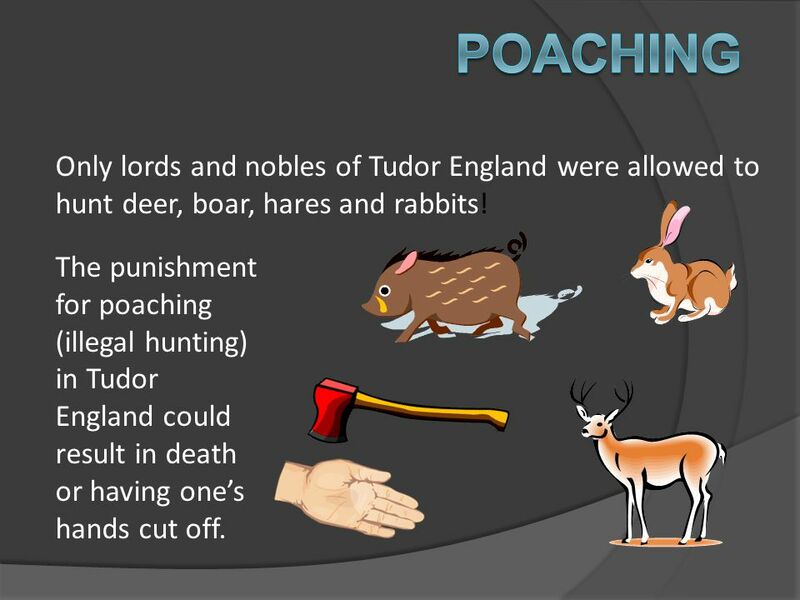 The punishment for poaching (illegal hunting) in Tudor England could result in death or having one’s hands cut off. 8 Bread The king and rich people ate white bread. 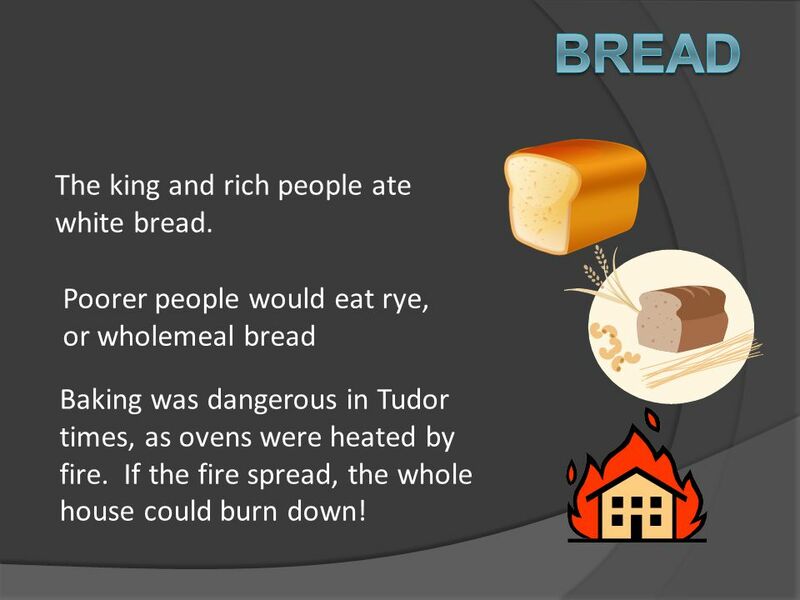 Poorer people would eat rye, or wholemeal bread Baking was dangerous in Tudor times, as ovens were heated by fire. If the fire spread, the whole house could burn down! 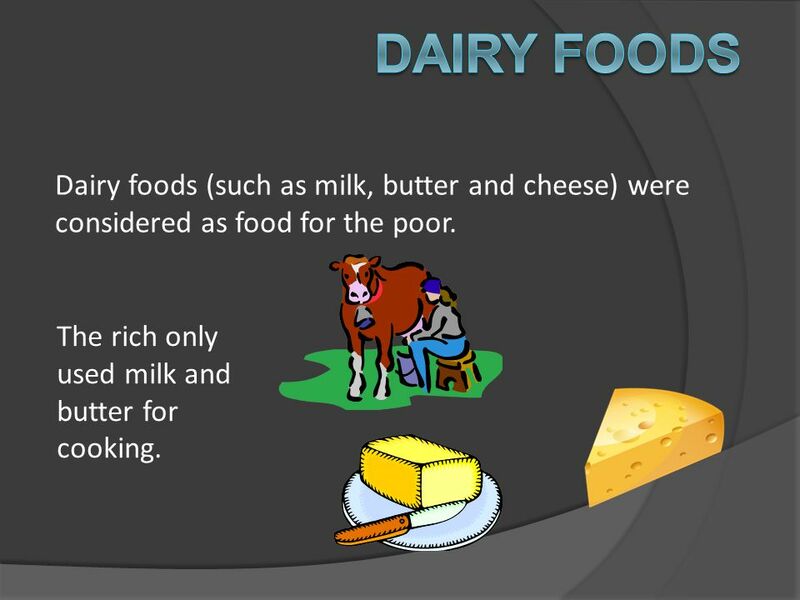 9 Dairy foods Dairy foods (such as milk, butter and cheese) were considered as food for the poor. The rich only used milk and butter for cooking. 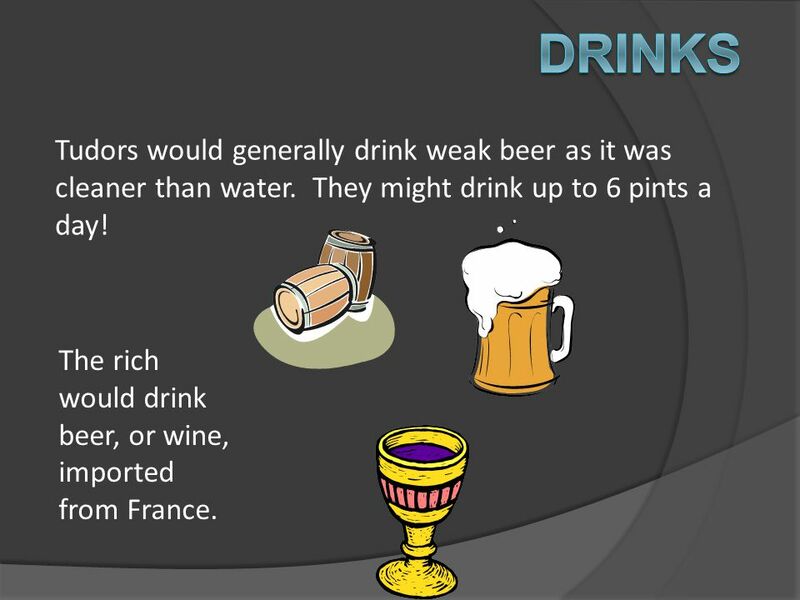 10 Drinks Tudors would generally drink weak beer as it was cleaner than water. They might drink up to 6 pints a day! The rich would drink beer, or wine, imported from France. Not all the food that we eat today was available to the Tudors. Such food as potatoes, tomatoes, sweet corn, cocoa and pineapples were only discovered in the Americas during Tudor times. 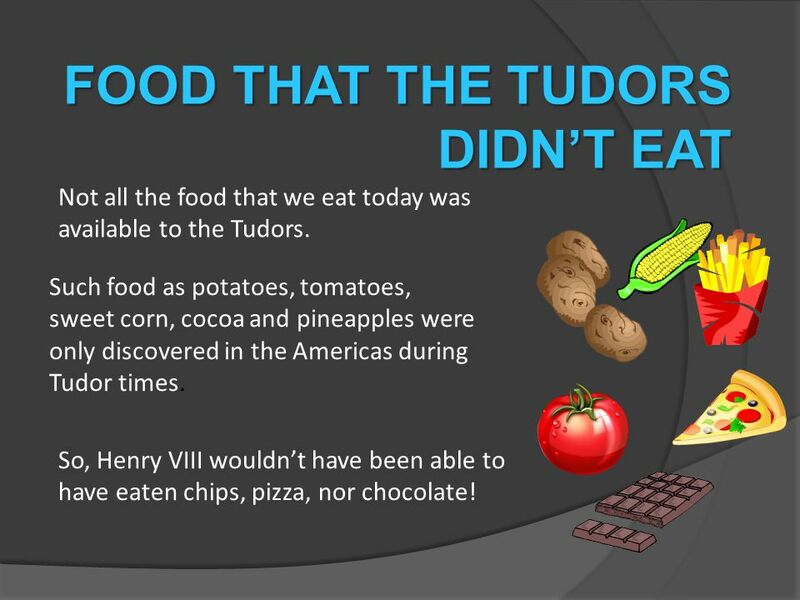 So, Henry VIII wouldn’t have been able to have eaten chips, pizza, nor chocolate! 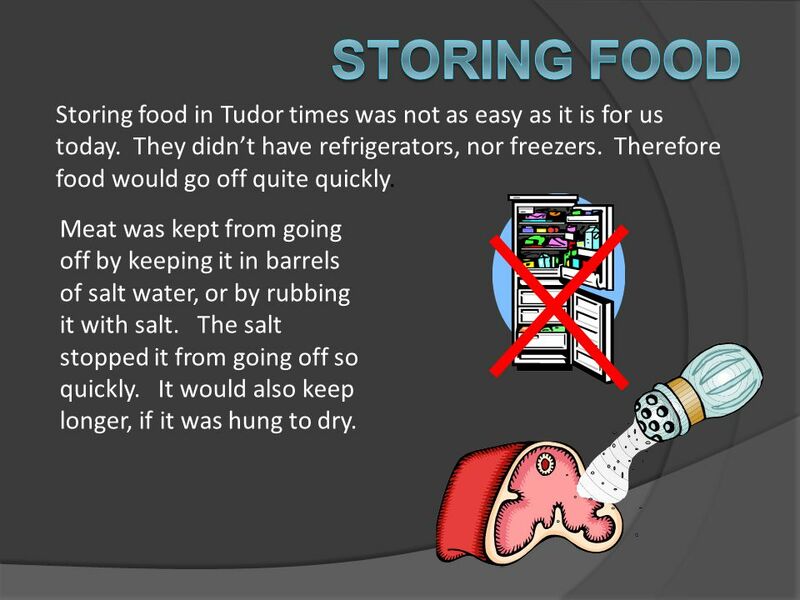 12 Storing food Storing food in Tudor times was not as easy as it is for us today. They didn’t have refrigerators, nor freezers. Therefore food would go off quite quickly. Meat was kept from going off by keeping it in barrels of salt water, or by rubbing it with salt. The salt stopped it from going off so quickly. It would also keep longer, if it was hung to dry. 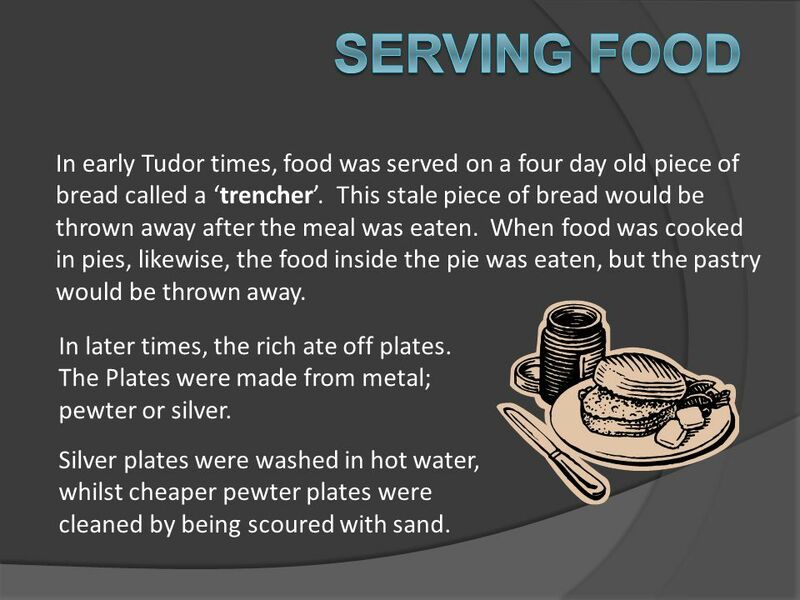 13 Serving food In early Tudor times, food was served on a four day old piece of bread called a ‘trencher’. This stale piece of bread would be thrown away after the meal was eaten. When food was cooked in pies, likewise, the food inside the pie was eaten, but the pastry would be thrown away. In later times, the rich ate off plates. The Plates were made from metal; pewter or silver. Silver plates were washed in hot water, whilst cheaper pewter plates were cleaned by being scoured with sand. 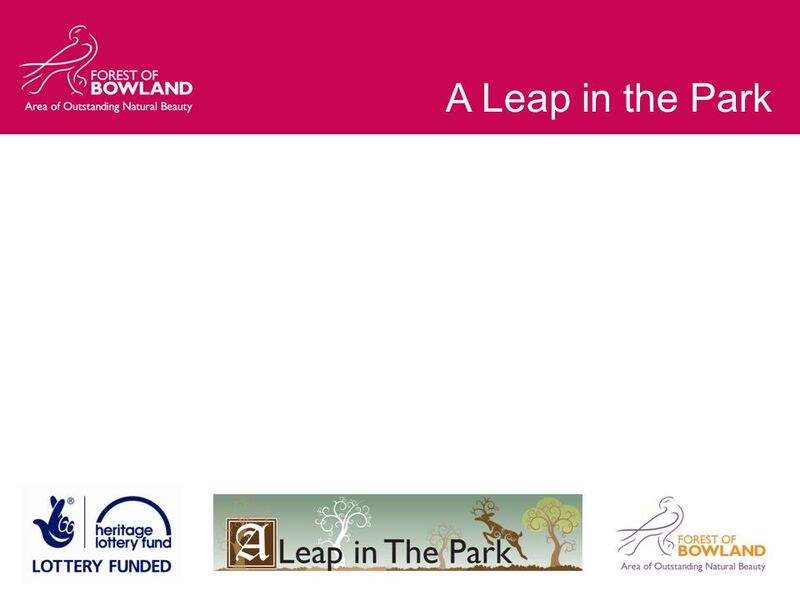 Download ppt "A Leap in the Park." The eatwell plate © Food - a fact of life 2008. MGR.LUCIA JURE Ň OVÁ FOOD. Yorkshire pudding This dish is not usually eaten as a dessert like other puddings but instead as part of the main course or. THE FOOD AND DRINK OF THE ANGLO SAXON PERIOD Completed by: Anna Estigoy, Christina Arellano, Adalbert Wong, Kevin Truong, and karen enriquez. To start with, Romans would usually begin their meal with a starter also called a “gustatio”. This was usually a type of salad or small meat dish like. Colonial Meals What did people eat for breakfast, dinner, and lunch? They DID not have steak for dinner btw  By Amy Xu 7A3. Medieval Food & Drink  In general, meals are taken 3 times a day.   What do they eat? → made by wheat, rye… (the more white flour, the more exalted. Elizabethan Foods By Adam Maddren. What I wanted to know What were the most common types of foods? What problems did people have with food? Cooking and restaurants. Ways of cooking food boil: in water, e. g. potatoes or rice fry: in oil or butter above the heat, e. g. sausages grill: under. Life on a Tudor ship. Sails The sails were made of strips of canvas and had rope attached to the edges to make the sails stronger. Different kinds of. Tudor Food. 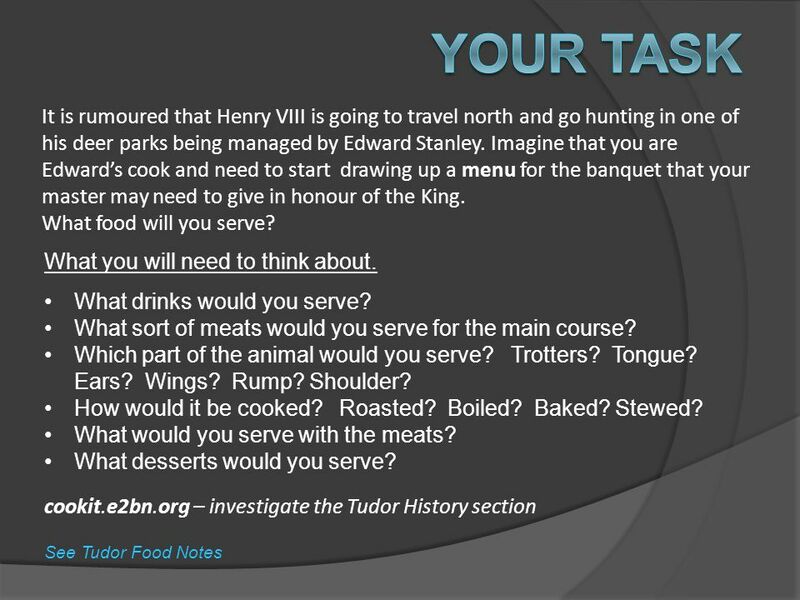 What Did Henry VIII Eat? The King picked from a large selection of food at every meal. A first course might be chines of beef, venison in. Tudor Food And Drink By Mimi and Eloise. Contents 1.Facts about Tudor food 2.Scurvy 3.Tudor meat 4.Leftover food 5.Drinks. BRITISH TYPICAL FOOD ENGLISH BREAKFAST FISH and CHIPS JACKET POTATOES SCONES JELLY APPLE PIE PANCAKES LEMON CURD.